TOKYO (Reuters) - Japan’s Marubeni Corp said it would no longer start new coal-fired power plant projects and will halve its net coal power generating capacity of about 3 gigawatts (GW) by 2030 to cut greenhouse gas emissions and tackle global climate change. 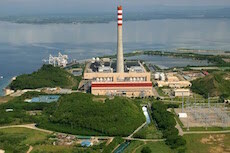 “As a general principle, Marubeni will no longer enter into any new coal-fired power generation business,” the trading house said in a statement announcing its new business policies on coal-fired power and renewable energy. The decision comes as a growing number of companies and pension funds across the world are divesting assets or companies that generate revenues from fossil fuels, especially coal. The new goal will be achieved by selling or transferring some of its coal-fired power assets and not renewing contracts at a time of expiry, a Marubeni spokeswoman said. But it added that it might consider pursuing coal-fired power projects that adopt the best available technology and are compliant with government policies, leaving leeway for new deals. Marubeni, which has a total of net power generating capacity of about 12 GW worldwide — the biggest among Japanese trading houses — aims to raise the ratio of power generated by renewable energy in its power supply capacity to 20 percent by 2023 from about 10 percent now. Other trading houses are also shifting their focus toward renewable energy in power generation projects. Mitsui & Co plans to boost the renewable power ratio in its 9.3 GW power generating capacity to 30 percent by 2030 from 16 percent now, while Sumitomo Corp is also lifting the renewable portion to 30 percent by 2035 from 20 now and slashing the coal-fired power ratio to 30 percent from 50. Mitsubishi Corp aims to double the ratio of renewable power in its electricity generation output to 20 percent by 2030 from 10 percent now. Japan has come under fierce criticism from environmentalists and more subtle pressure from allies as it is one of the few industrialized countries to heavily promote coal power both at home and abroad, including advanced technology to reduce carbon dioxide emissions. Given that pressure, companies and financial institutions in Japan have been slowly changing their coal policies over the past year, with some trading houses offloading thermal coal mining assets, and banks and insurers stopping financing coal-fired power projects.